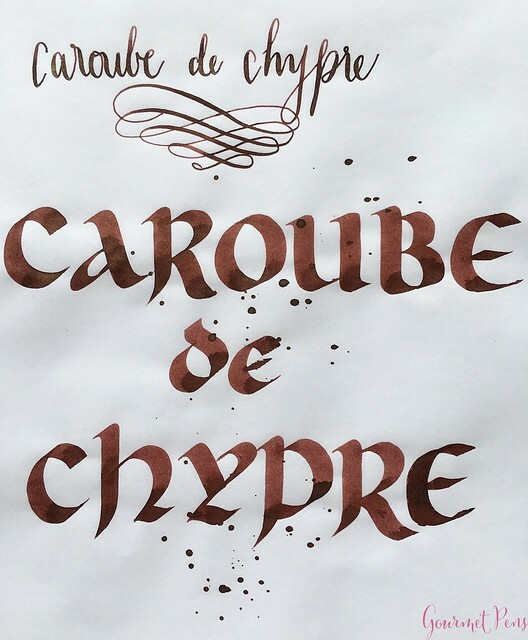 A drop of Caroube de Chypre on Schizza e Strappa paper - highly saturated, with varying states from edge to middle: milk chocolate brown, iridescent green sheen, and a gold flake middle. 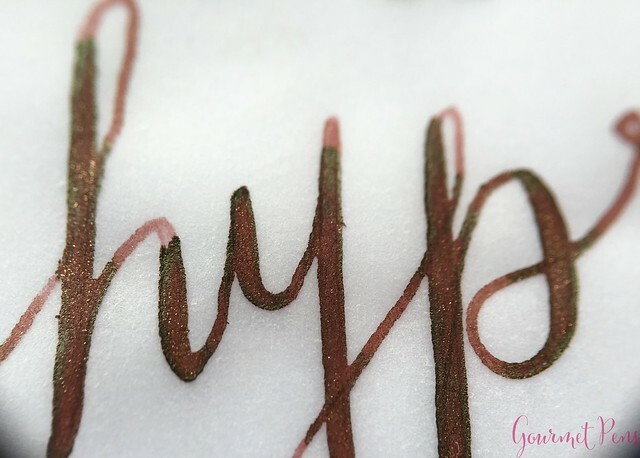 When Emerald of Chivor hit, most people went a little nuts. I assume the same will happen again, and for some people, that's not worth it. That's cool. I myself only had a sample for over a year before I picked up a bottle when they were readily available. 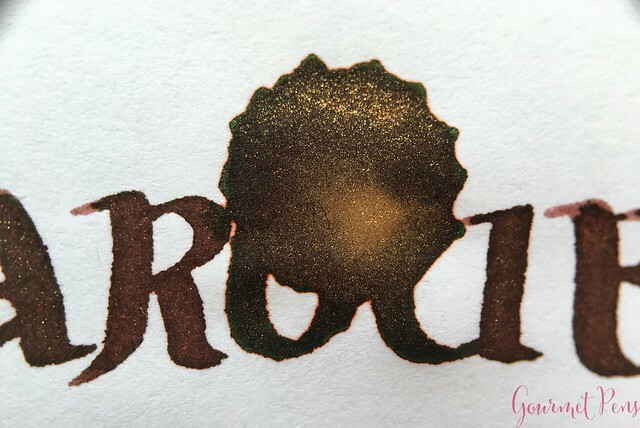 I will probably do the same with this ink because I have more than enough ink to keep me occupied, but I'm really happy to be able to share this sample with you. 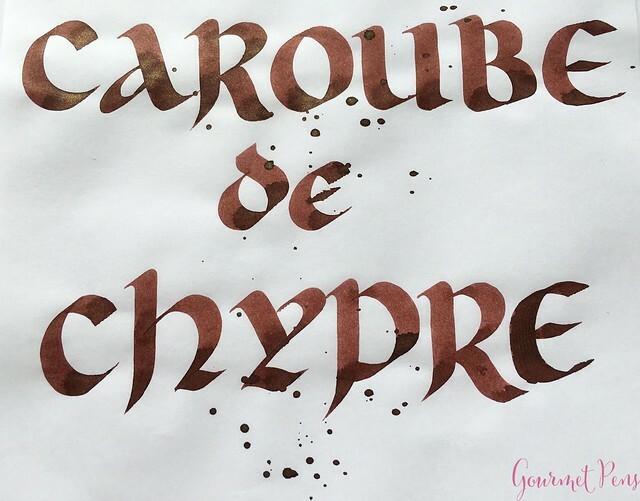 Thank you to Bureau Direct for sending a sample of the new Caroube de Chypre over for review! 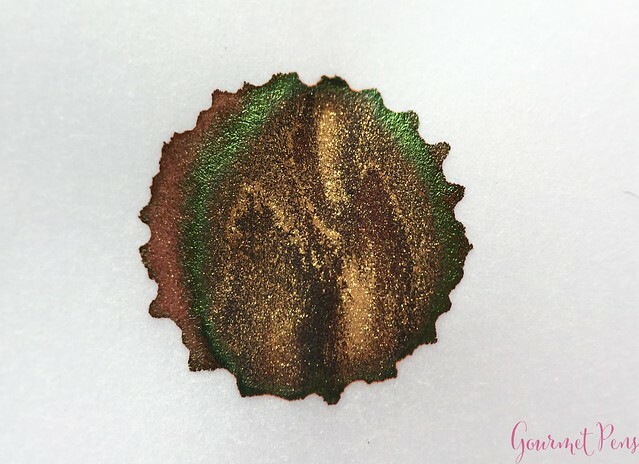 The ink of Louis XIV, Napoleon and Victor Hugo, used to sign treaties at Versailles and write Les Miserables, quite literally the ink of Kings. This is the special 340th anniversary ink produced by J. Herbin in a beautiful glass bottle with celebratory wax seal and presentation box. 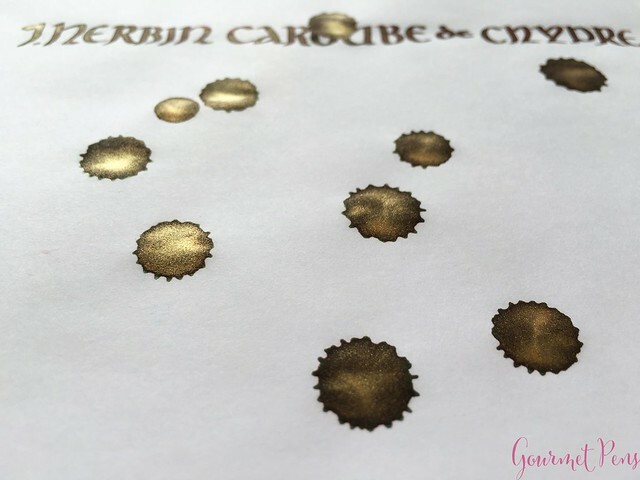 50ml bottle of J. Herbin 1670 Caroube de Chypre (brown) with a red sheen and gold flecks, to be released in July 2016. 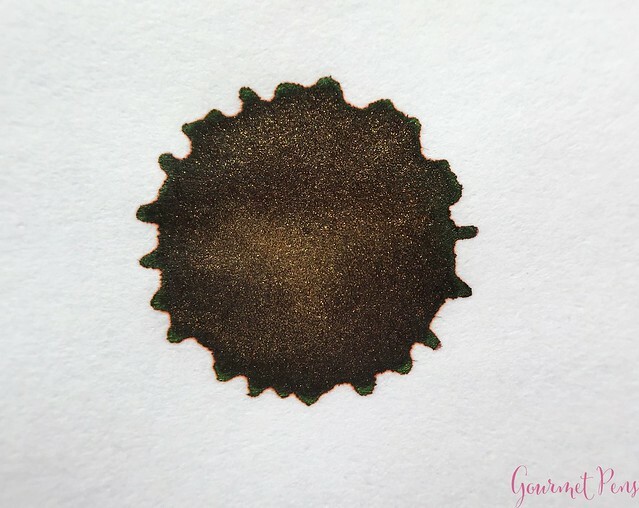 This is the fifth ink in the 1670 series. Each 50ml bottle is hand dipped in sealing wax with a stamped “1670” seal on the front and individually packaged in a collector edition box. 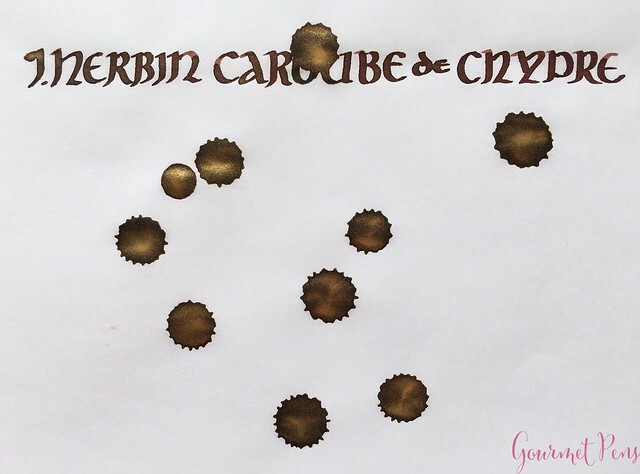 It is said that J. Herbin was very fond of dried carob pods and that is the reason he lived so long! As the other merchants sailing the Mediterranean sea, he would pick them up in Cyprus, on his way back home. The carob bean is the fruit of the carob tree and was cultivated in the Mediterranean countries since ancient times. Carob pods are known for their great therapeutic properties and were marketed throughout Europe as the “black gold of Cyprus”. 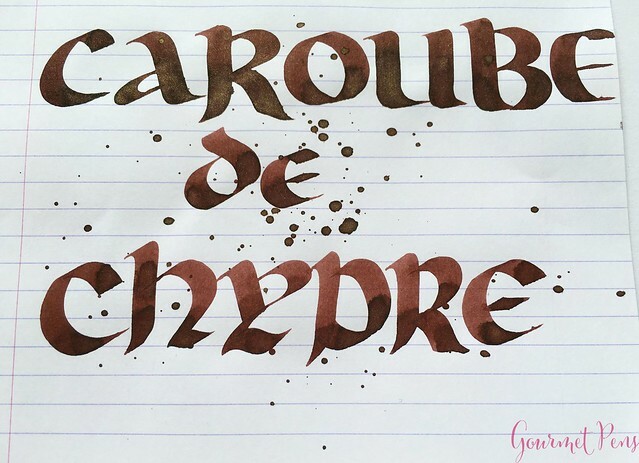 This new Anniversary ink is called “Caroube de Chypre” because of its intense and deep brown with a hint of red, and of course its gold specks”. 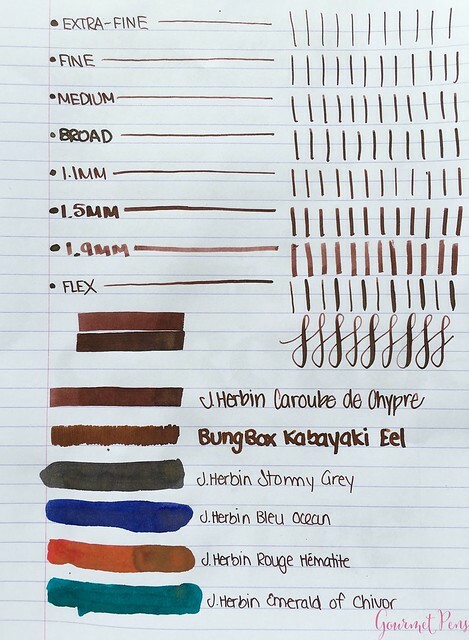 Wonderful, warm brown base color. 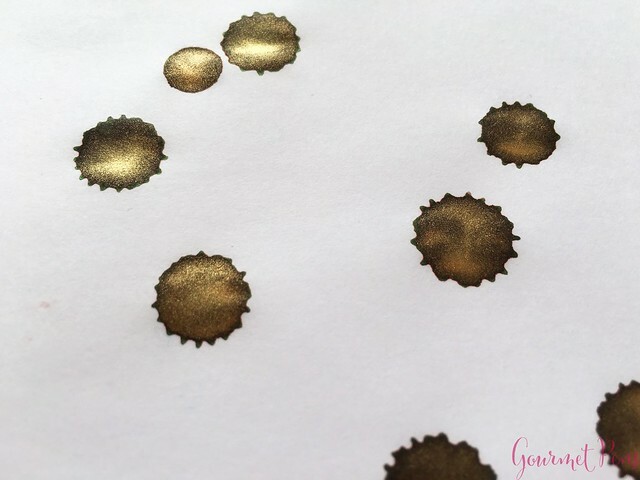 Gold on top is a rich complement to the warmth of the brown. 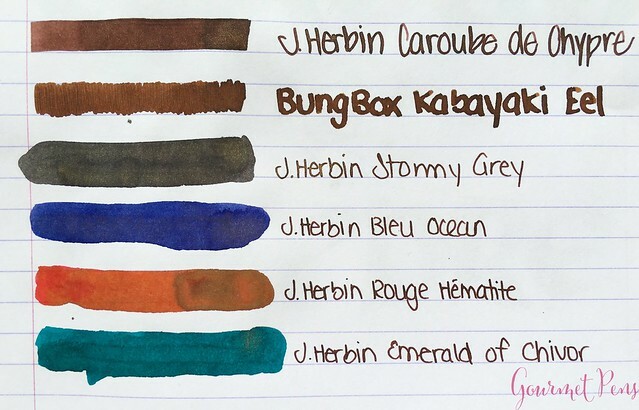 A great ink for drawing attention - cards, notes, etc. 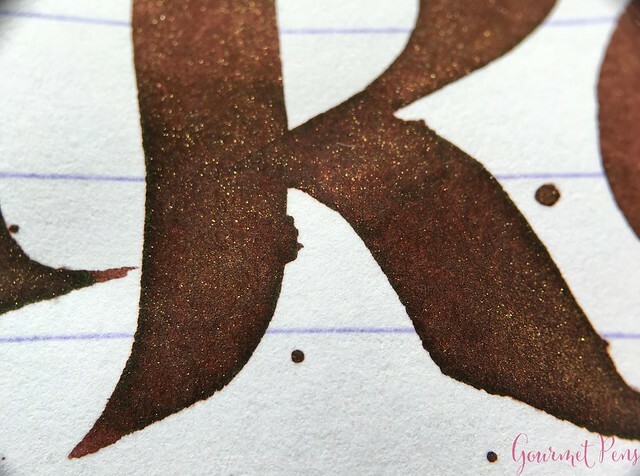 Green sheen is really pretty. 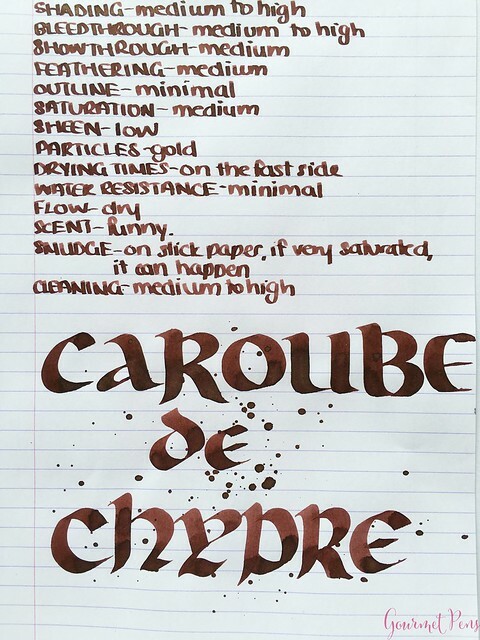 With highly saturated inks or with inks with particles, extra care is needed. 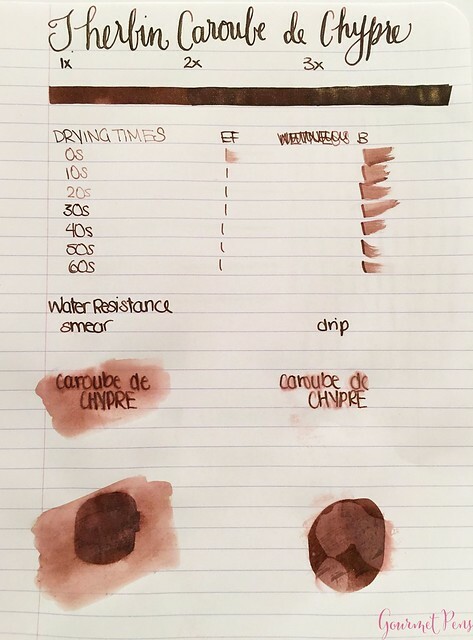 Practice good pen hygiene so the ink doesn't dry out in your feed, and make sure to flush well to remove the particles. 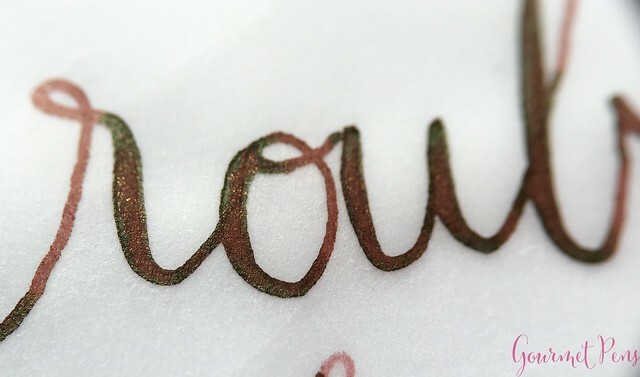 A finicky ink - fairly high on bleed through, show through, and feathering. A very narrow mouth on the bottle - if you have big nibs or wide sections, it can be difficult to fill from. 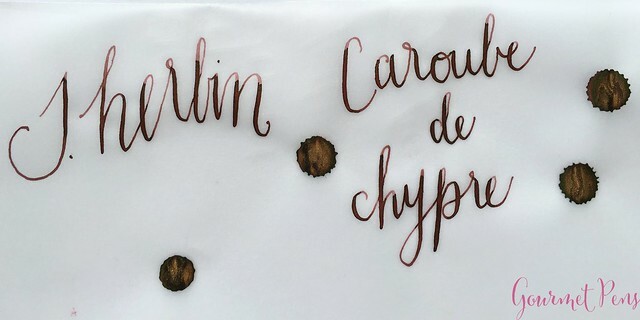 As usual with J. Herbin's anniversary inks, Caroube de Chypre is unique, special, and a lot of fun to use. I think this is a beautiful mixture - the brown and gold are rich and warm together, and I really like it. 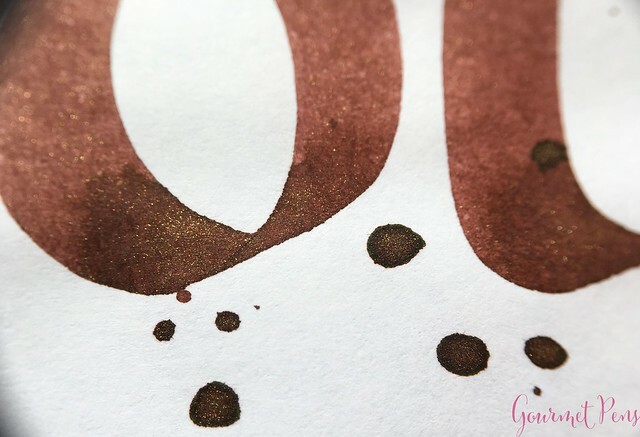 Shimmer and particles and gold flecks aren't for everyone, and I can't be 100% sure this sample is entirely representative of the bottle's ink to fleck ratio, but I don't think there are as many particles in this ink as we saw with Emerald of Chivor/Rouge Hematite. The brown base can still be seen. 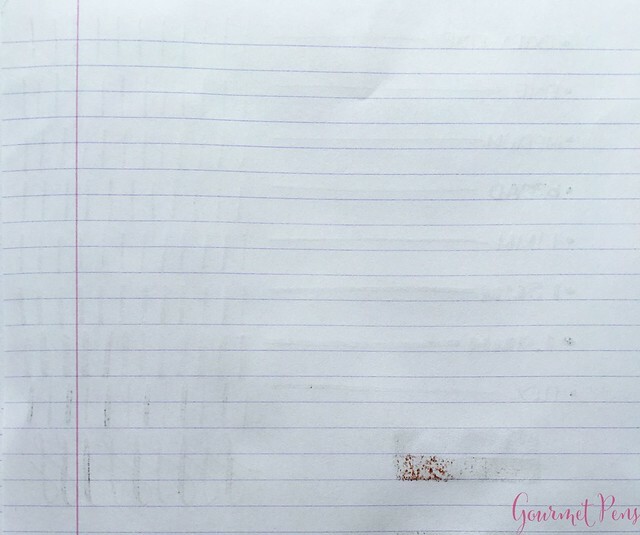 I received this ink free of charge for the purposes of this review. I was not compensated monetarily for my review. Everything you've read here is my own opinion. 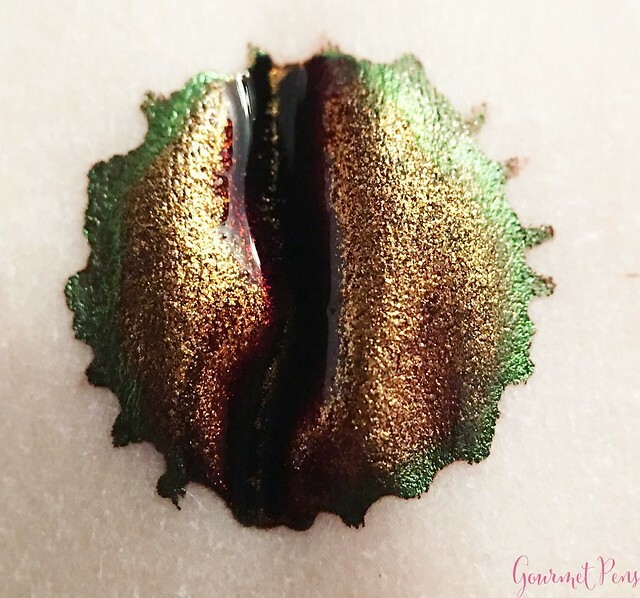 There are affiliate links in this review that do not cost you any extra should you choose to use them, but help support this blog (that's me!). You are not obligated to use any of them!